I can’t resist picking up my crochet hook to start yet another bag or purse. I need only a small amount of yarn for a bird, a flower, a non-figurative ornament. I have a lot of left over yarns that I store according to yarn weight. Thus I can easily find yarns that can be used together. In this case I used yarns from Jamieson & Smith, Jamieson’s, and Pirtin Kehräämö. I found the designs in two books with cross stitch patterns. The birds are traditional Scandinavian, the “spindle whorl” is from the book “Grafiska korsstygn” by Renée Rudebrant. 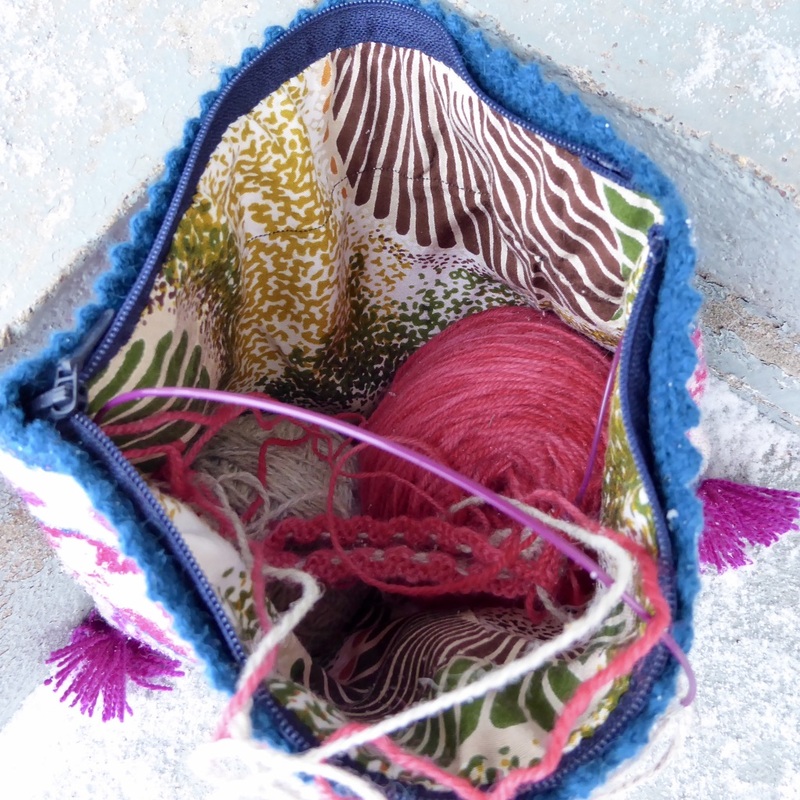 The project bag is sized for a small knitting or crochet work. 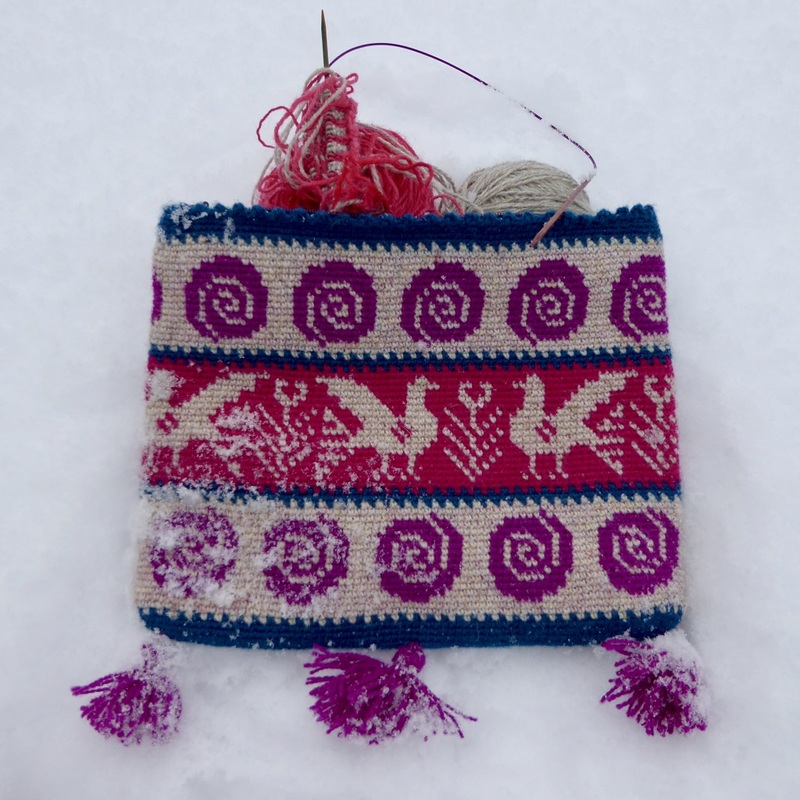 It also takes two 100 gram yarn balls and circular or 20 cm dpn needles, small scissors, and tapestry needles. I’m thinking of adding a short strap. The idea is that the bag will fit into my smallest back pack amongst other necessary things, so I won’t make a big shoulder strap, only a short one for easier carrying. Tapestry crochet is a lovely technique! Slow, meditative, and you need to concentrate as unraveling means a lot of extra work. Here’s Carol Ventura’s awesome site: Tapestry Crochet. If you want to see me crocheting in 2009, look here! I’ve done a lot more since then, and oh how young I looked… Please read about the other persons in the “Portraits”, there are awesome crocheters portrayed. November 12, 2016 - 3:32 pm Marilyn F.
What a nice little crochet bag and what memories you must have when you open it seeing the curtain lining. I also visited your “here” crocheting and loved your rose colored bird bag and your spindle bag for Precious – so very creative with its patterning and lettering. It is precious in itself – precious for precious. Oh, yes, I also wish I could go back a number of years to capture the youth/beauty I wasn’t aware of at the time. Thanks for sharing. SNOW! But the bag is lovely. And the lining is truly special, lucky you could use it for that special bag. Nice to hear you like linen too! Yes, linen is lovely and beautiful. I’ve been collecting Swedish strick from different sources for some years now, but it’s not easy to find. So my spinning and weaving will not look like professionally spun and woven linen. I’ll have to weave narrow pieces of fabric and sew them together. November 14, 2016 - 2:46 am Marilyn F.
What a nice picture you submitted of your wheel and fiber for Womember’s Instagram competition. How do you get such beautiful rolags? They look like perfection to spin. Thank you! I make punis, I’m very bad at making rolags. I like punis because they’re more compact than rolags = easier to store for a longer time, and to transport. I use two pretty thick dowels so there’s air in the punis. November 14, 2016 - 2:50 pm Marilyn F.
Ah, that’s a good idea. I have not done that. Glad to know they store and transport better. I like to hand card but it is not as efficient time wise as drum carding.